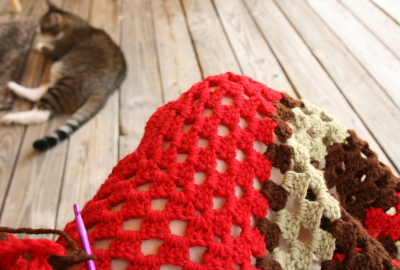 My Granny Square Poncho is nearly done. Its currently pinned out and blocking under the Texas sun. It will probably be dry by the time I finish putting this post together. Then it will be Fringe Party Time. I have been taking notes and, as simple as this poncho is, I suppose its worth writing down and publishing as a pattern. A free one of course. 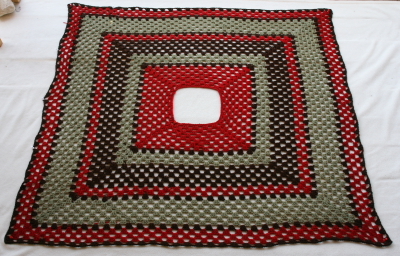 No self-respecting granny would pay for a pattern that is just a giant square. She’d just figure it out for herself. Its hot these days and I of course love it. This time of year I can wear shorts and go barefooted. Well, I can do those things in my own home. Everywhere else there is an AC running full-bore and I have to wear pants and long sleeves and sometimes knit hats and shawls and fingerless gloves and don’t look at me like that. I can’t stand cold air. 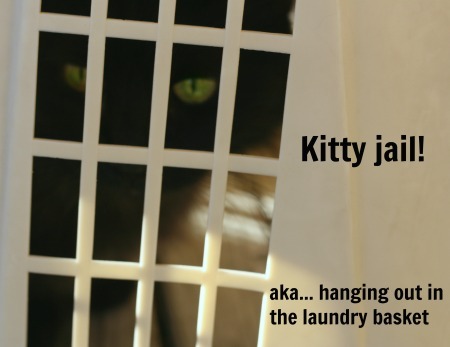 while enjoying some feline companionship. 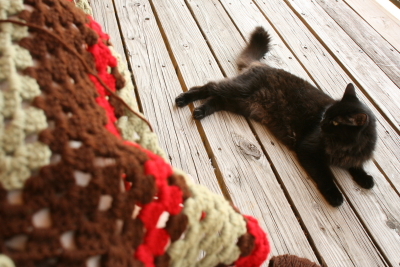 So I’ve been making my granny sqaure poncho, made from 100% 1970’s vintage acrylic yarn, while hanging out with my cats. Oh, and I’ve taken to wearing reading glasses while I do it. I’m in full-on granny mode. And do you know why? Because the moving of this blog to its new home was so problematic that I had to start acting like a granny with everyone to get it accomplished. Now if your mental image of a granny is a sweet, pleasant, and somewhat ineffectual older woman then you have been fooled. That is just a facade. You think that because grannies everywhere have decided to hide their awesome power under a veneer of smiling flutteriness. Let me clue you in to reality: Grannies get what they want. Grannies don’t stop. Their patience is endless. You may think you can ignore a granny and her requests but you just kidding yourself. Those are not actual “requests” that she is making. Those are pronouncements of what you will do and/or how the future state of affairs will be. Like when you deal with the borg, resistance is futile. Not only will you do what a granny wants you to do but you will do exactly the way she wants it to be done. If you are say… putting in a new storm door for her… you will put the door in without tracking in a lot of dirt and without flinging your tools everywhere and without leaving it half finished while you run home for just fifteen minutes. So there I was trying to get my old blog away from the people I had been paying to host it for me so it could live with the new people I’m paying to host it for me. And I learned that my old host was not giving up my blog (or data or pages or whatever this stuff actually is inside a computer). And I called them to talk about that. And they hung up on me. That’s when I went into Full Granny Mode. I didn’t yell. I didn’t call the Better Business Bureau. I didn’t demand to speak to anyone’s supervisor. I just called technical support back. I called them every hour for six hours. I talked to six different people in that technical help department. I was sweet and patient and unrelenting and I just didn’t understand why I couldn’t get what I wanted exactly the way I wanted it. The first five people told me to have a nice day and hung up. The sixth said “Of course I can help you with that” and transferred my blog. See? Grannies get what they want. So when I found that my new site had done something which broke every link between pages, I called the new host company and acted like their grandmother. I called over and over until that was fixed. My pre-existing visitor statistics disappeared somewhere in the move. I had no record of how many people had come to my blog at its old host. I was told that data was lost and couldn’t be recovered. I had to just accept this and move on. I don’t think so Scooter. Now I have all that old visitor data. Of course I do. I called people and acted like their grandmother until it got done. Grannies get what they want. 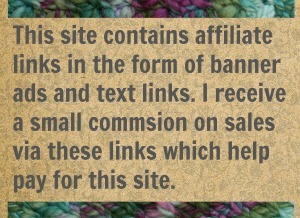 I wanted a new blog host and a retro crochet poncho and now I have them. Its very, terribly satisfying. I may have to exert some self control over this new found power. Or I may use it to take over the world. 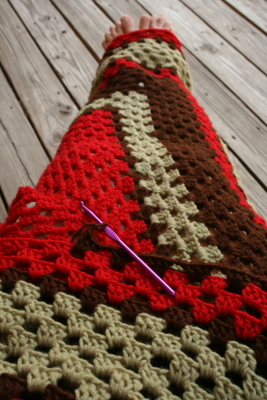 14 Comments on "Channeling My Inner Granny"
I was hoping you would publish the pattern I would love to make this! Then its for certain. I’ll get it written up and published. That’s the easy part actually. Finding someone who will take my picture in it is always the biggest challenge. There is a wonderful old Beach Boys song about the little old lady from Pasadena….maybe you are just channeling her? Love the poncho! May have to try some of my hand spun llama (yes, it gets that cold in northern Colorado) after you publish the wonderful pattern! Northern Colorado certainly does get that cold. For me “:that cold” would probably be in September. LOL! Welcome to the Granny club. But just so you know, the tactics rarely work on other Grannies. I love the poncho. Will it have beads or tassels? I’m voting for beads, maybe conchos. A Concho poncho. Tassels for certain. Beads are a maybe. Conchos..? Maybe in the matching headband, lol. Ohh, if someone has a source for conchos, please share. Granddaughter has developed a taste for things Western that I want to encourage! There is a .com for everything I guess. But conchos.com is real and they have a 20% off sale going. Ooo- beads would be so lovely! You are awsome. Never ever under estimate the power of a Granny. I think using your powers to take over the world would do all us Grannies proud. My grands and great grands all call me Granny! We started families early (that’s what I tell people). Yes I too would like a look see at that pattern. I’m a fellow cld body also. Oh my. Are you encouraging me? lol That is never good! Grannies are severely underestimated and even though I’ve pulled the curtain back, it won’t change a thing. People see what they want to see and they want to see fluttery old ladies. I guess grannies use that the way soldiers use camo clothes. The target doesn’t even know they’ve been captured/destroyed until its over! Whoa. I am sooo glad you choose to use your powers only for Good!